Hi Stacy! I am so happy that you were inspired to add a photo with you in the frame because it is a beautiful one! And I love all of the rest of your photos of your adorable fur baby! Your 2-page layout is fun and fabulous. (I need to remember to do 2 pagers!!!) Thank you so much for joining us at Challenge YOUrself this month. We are thrilled that you did! Wow! Fabulous dobuble page layout! Your new puppy is adorable! I’m loving that stripes paper and cute embellushments.Thanks for joining us at Challenge YOYrself. Awesome Double Layout! Your puppy is sooo sweet!! Love your design! 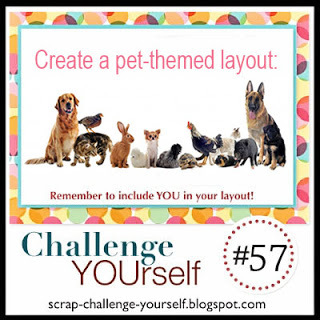 Thanks for playing along with us at the Challenge YOUrself Blog! !